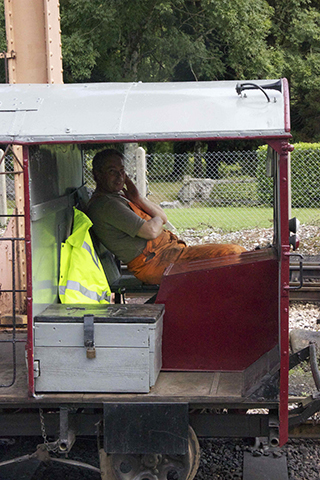 One of the more unusual workings to take place today, 08th September, on the South Devon Railway, saw Allan Cash drive his Wickham trolley from Buckfastleigh to Staverton. This was in preparation for next weekend’s Heritage Transport Weekend, when it will be giving rides in the yard at Staverton. This is part of the Permanent Way display there, which in turn is a feature of the “Behind the Scenes” events running on the SDR all weekend. The trolley is seen waiting at the loop starting signal, awaiting arrival of the incoming passenger train from Totnes. 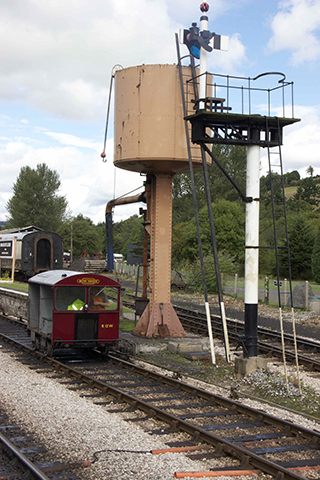 On completion of his mission Allan Cash successfully managed to cadge a lift back to Buckfastleigh on one of the diesel footplate experience trains, also running on the day.